Celox™ has been proven to stop life threatening bleeding and has been on sale for over 10 years. 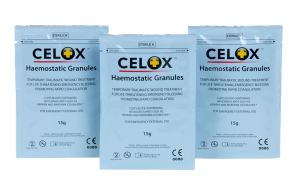 Celox Granules are safe and effective and registered as class III CE marked medical devices. In an independent trial by the US Navy, when compared to Quikclot* and standard gauze, Celox™ Granules was the only product to give 100% survival and was also the only product to give robust clotting with no rebleeding7. 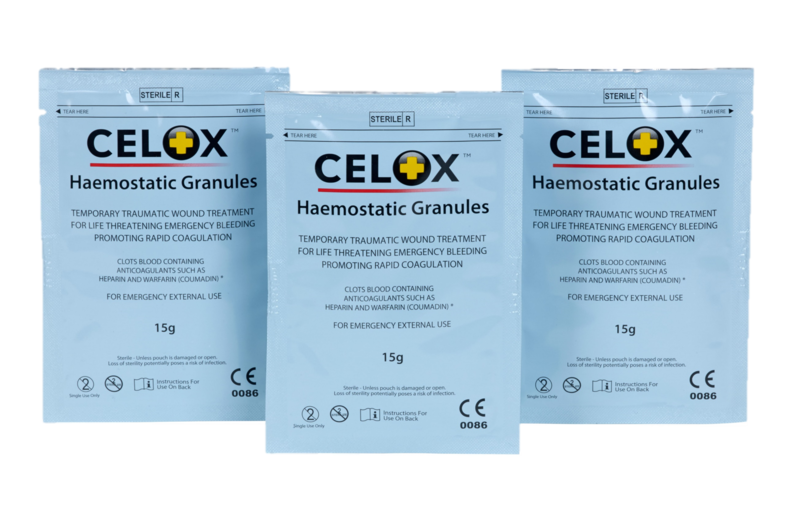 The Celox™ Granules mould to the shape of the wound to get firm pressure on to the source of the bleeding even in complex shaped injuries. Clot blood containing Warfarin or Heparin. Easily removable but residual chitosan is naturally broken down and excreted by the body. material to treat a life-threatening injury.